I would love to know who has these photos.have you any more? This photo was taken at Glenbuchat Upper Lodge, perhaps in late 1950's?. 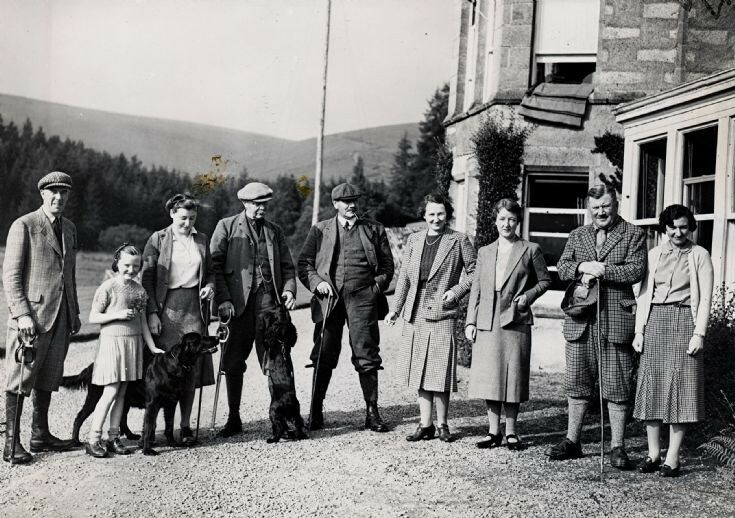 Figures identified are; second form the right, Col James Barclay Mile, laird of Glenbuchat; third from left, his daughter, Florence Barclay Milne (married name Sole). Can anyone identify the others? Second in from left is Jessie barclay miln. (my late mother) next to her my aunt, Jean barclay miln. ( my aunt) far right is col jb miln. I can't see Bo. She was the middle sister. In age order is Jessie. Bo. Jean. Sadly all now deceased. Bo or Florence middle sister lived at kinadie house. Jean at the lodge. Jessie my mother lived at moatenden priory. Yes, third from left is Jean Sole - not Florence. Apologies for mistake.